Do you find the split menu bar in Facebook’s mobile app annoying? Why’s there an easily triggerable gesture to open the menu bar when the button’s already right there? You’d think there would be a toggle for the gesture built into the app, but there isn’t. What about the way Facebook looks? 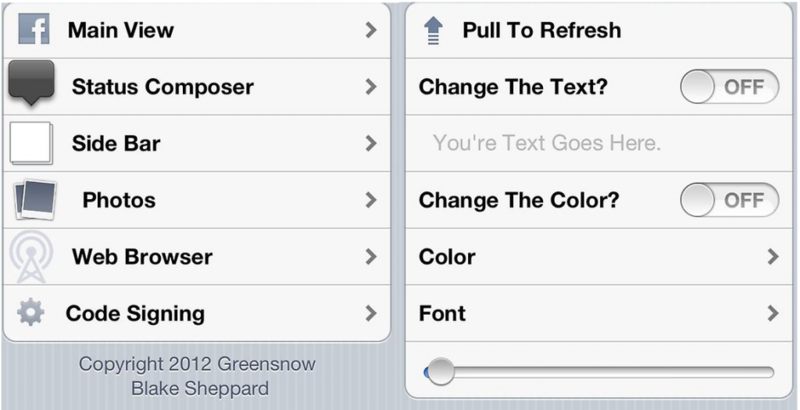 If you could change the color of the menu or the buttons, or tweak the font, would you? With Customize Facebook Pro, you can. The original Customize Facebook app was broken with the Facebook app’s recent UI overhaul, so the developer, Greensnow, created Facebook Pro from the ground up. Meanwhile the features have been expanded on since the original release. There’s now a menu that devides the tweaks between different section of Facebook. (Main View, Status Composer, Side Bar, Photos, Web Browser.) It’s mostly focused on customizing font and color and disabling unwanted features. Keep in mind that although you can download Customize Facebook Pro to your device from Cydia for free, this is actually a paid app. There’s a link in the Settings Page which will allow you to pay $1.99 directly to the developer’s PayPal in exchange for an unlock code. While this is a clever (and increasingly common) method to prevent pirates from cracking and distributing the app, for the rest of us this will become another string of random digits to remember. Another annoyance is that the price is not listed on the Cydia page. It would be far more convenient if Cydia included a method for storing these account-specific codes, so developers could protect their apps while making the process transparent for the end user. Share your thoughts about Customize Facebook Pro and the state of security for developers of paid apps in the comments section below. facebook give it free, and u guys a making profits?? @mmm those people made the app/tweak. So they worked for their money. Then I’ll have a lot of work for you. I purchased this tweak and about 2 weeks later it was asking for me to register my phone again which is another purchase….I have contacted them as I deleted the registration key….doubt I will hear anything back….a few bucks down the drain…. I have installed this app on my iphone and have been trying to delete it does anyone know how to do this?